Here we go… Looks like someone’s been busy. Omg. What. WHAT. Go Rana go! Well this may why they’re atop of the solitary tower, in sicret. She has standards, and they all involve goatees. I think she just likes the bad boys. ‘Cause everybody knows guys with goatees are villains. Ah, but I am evil, so it still works. Bad boy status confirmed. He’s evil. That sunset/forest backdrop is absolutely gorgeous. All those stripes are purple. The pillar was a giant yellow stripe. Interesting. How are your hands? Panel 3 makes me uncomfortable. He’s like the Meek version of Ceiling Cat, except without a ceiling and probably not a cat. *laughs* This is not Game Of Thrones v2.0, David. This could be a daydream. She seemed to be a very no-none sense kind of person previously. Or she could be cultivating him to assassinate her father. Or the death of her mother changed her personality. No-nonsense doesn’t have to mean joyless and single-minded. Luca did say she’s too old to be unmarried! And her SO is pretty hot, too! And looks like he’s trying to be attentive and stuff. Is there a special reason why frogs? Or did Rana happen, and the other names just followed? There’s a reason, but I think it might be somewhat spoilery, haha. But Suda’s full name is Sudacris (Pseudacris). OMG, I think I just realized what you’re doing with “Luca”. Niiiiice. Haha, that is actually not related at all… it was back a long time ago when he was a character in a comic about werewolves v__v really long time ago. Awww yeah, I remember noticing this… holy crap, almost six years ago? Six years? But, but, we are but young children! So are we going to see a giant magical frog? How do you stretch out a frog? Don’t test me Brad, I will make the longest frog you’ve ever seen. Rana also means ‘wound’ in Croatian..
That adds a whole new and unpleasant connotation to the chapter title. Froggies with yellow stripes are usually the sort of small, brightly-colored froggies that you really want to avoid touching or even looking at for too long. Poison. Hrm. What a beautiful first panel. 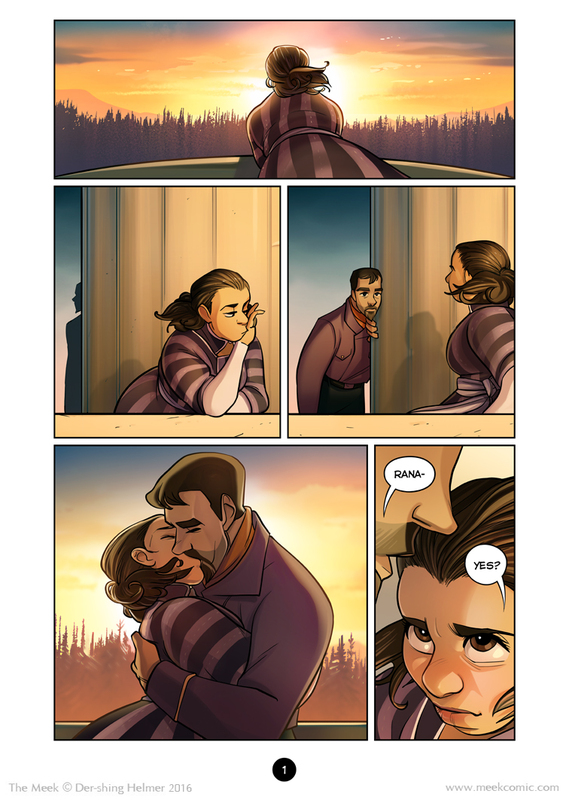 Not only are all of these panels gorgeous, but Rana’s got herself a hot man. The first panel is very evocative. Excellent lighting. Oh gawddd be careful, Rana. I can see mad dad Luca getting rid of this guy in a not-so-nice way. Ahhh, this guy is so hot, his facial hair–!! I must know his name. Hopefully soon, right? If he is, the next panel will probably be Rana judo-ing him right over the balcony railing. Croak meter rising. Hopefully he’s militarily trained or some such. It’s been so long since we’ve seen her. That last panel made go back to Chapter 2, to see how Rana looked back then. Your art, excellent as it was back then, has improved significantly.